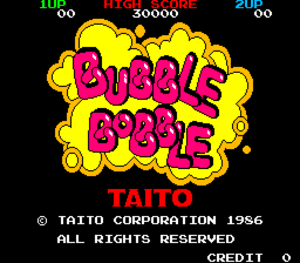 Bubble Bobble was an arcade game by Taito in 1986. 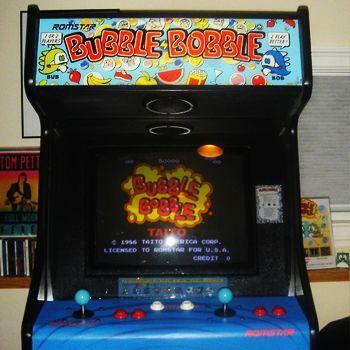 In the game, each player controls one of the two Bubble Dragons, Bub and Bob [a.k.a. Bubby and Bobby]. The player can move along platforms, as well as jump to those above and to the side, similar to most platform games. The player can also blow bubbles. These can trap enemies, who are defeated if the bubble is then burst by the player's spiny back. Bubbles that contain enemies can be popped at the same time resulting in different foods being projected throughout the level. Each enemy trapped in a bubble equates to a different food. Food is consumed and transferred to points (an increasing scale of 1000 points is awarded for each enemy burst in tandem with another meaning: one enemy burst equals one food item worth 1000 points, two enemies burst equals two food items worth 1000 and 2000 points, three enemies burst equals three food items worth 1000, 2000, and 4000 points, and so on) which results in more lives. These same bubbles also float for a time before bursting, and can be jumped on, allowing access to otherwise inaccessible areas. Players progress to the next level once all enemies on the current level are defeated. The game becoming very popular and led to a long series of sequels and spin-offs!